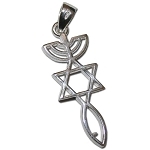 Pendant Size without the bail: 1" x .75" | Individually boxed with a card: "About the Holy Land Mother of Pearls"
Beautiful decorous "Mother of Pearl" Diamond shape Crosses. They come in a "See-Through" Jewelry Box. ~ every woman will be proud to wear! Your Christian Jewelry offering Just got Richer! Add these to your offering of unique Christian Jewelry! * Mother of Pearls carvings started in Bethlehem about 700 years ago. Brought to the Holy Land by the Monks and was skilled by the local resident. Long known as the "Queen of Gems". Pearls possess a history and allure. Decorative Mother of Pearl was used at least as far back as 4200 B.C. Mother of Pearls symbolism represents fertility and rebirth.